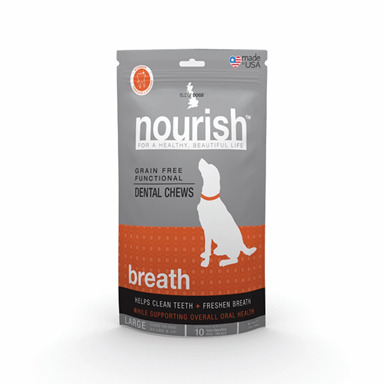 Isle of Dogs’ Nourish functional dental chews feature two layers: a grooved exterior layer made with Pecodent, a proprietary blend of finely ground pecan shell, kelp, and turmeric extract; an interior layer to supplement health. The Made in the USA, veterinarian-formulated chews contain no grain, gluten, soy, wheat, corn, added sugar, or artificial flavors or colors. Available in Hip + Joint, Breath and Skin + Coat recipes in small, medium, and large sizes.